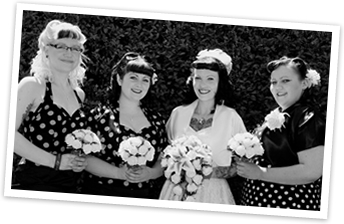 Do you have a special occasion coming up, a night out, vintage club or party to attend? Give us a call we can help, we have a base in North London Zone 2 and can travel within Central London. Party Fun- Girl's Night In? Hen Party? Birthday Party? 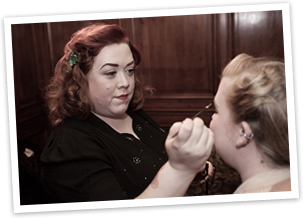 Add a vintage twist to your plans, we can come and style and paint you or lead your party in an interactive tutorial. Either way there is lots of fun to had with a Vanity Box party. We can look after all the hair and make up needs on your big day. Call or email us for more details and availability. Can't get a grip of those pin curls? Want Victory over your rolls? Cat Eyes gone to the dogs? We have a range of lessons and tutorials which can be booked one on one or for groups to set you on the right road to Vintage perfection. 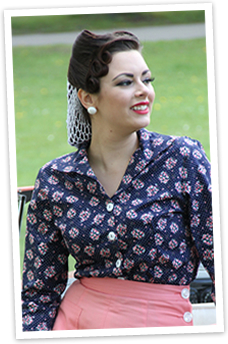 We can provide a pop up hair and make up parlour for Vintage Fairs, Weekenders, Weddings and Parties. Provide something extra for your guests. A great addition to your event, we can teach a hair or make up lesson, provide a pop up hair and make up parlour and much more. Why not try a personal shopping experience? If you are starting on the road to effortless vintage glamour and need some guidance with day packages available in Central London. If you have ever wanted your own pin up photostory? We can make it happen! Contact us for up coming sessions.